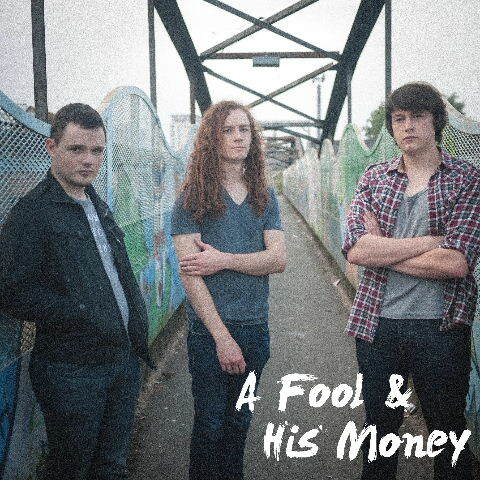 A Fool and His Money is a three piece alternative rock band in their early 20’s from the South Wales area. Formed from the long-time musical relationship between Drummer Alistair Morgan and Guitarist Michael Buffery, the band came into being when Lead Vocalist and Bassist Greg Williams answered an ad placed online in spring 2014. Over the course of a few months, the band wrote, rehearsed and recorded their first EP, Machine Gun Artistry, in Alistair’s garage on a tiny budget with only four microphones. Taking in the ideals of classic rock bands of the 60s and 70s the recordings were done with no digital editing and as live as possible, allowing the sound of the band to come through instead of the sound of a computer. The band have already had significant airplay on BBC Wales Adam Walton’s show, Tom Robinson’s BBC 6 Freshonthenet Mixtape and on Aaron Phillip’s Amazing Radio show. In the coming months the band will begin performing live sets in the local Cardiff area with the same passion and intensity that their recordings have, and will be looking to release more material in early 2015.